Thanks to effective lobbying by civil society groups, independent experts and governmental actors, the dams were cancelled and environmental justice could be served to a unique ecological, social and cultural region. The Dong Nai dams no. 6 and 6a, located on the Dong Nai River, were planned as part of a series of dams proposed to cover Vietnam’s growing demand for energy. However, the Dong Nai River has always been a crucial source of water and life for the surrounding villages and ecosystems, such as the Cat Tien National Park, which received UNESCO’s recognition as a Biopshere Reserve Zone in 2011. Being a unique place of historical richness and cultural tradition, providing home to more than 1,700 species of rare plants and 700 bird and mammals species, many of them endangered, the The Cat Tien National Park is one of the six biggest biosphere reserves in the world [1;2]. 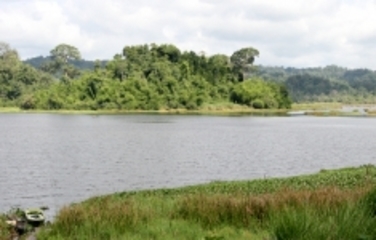 During the recent years, the park was under threat to lose its status as National Park, due to the planned construction of the two hydropower stations. Expected impacts beyond those generally associated to large-scale hydropower (i.e., changing hydrological dynamics, loss of riparian ecosystems, blocking of fish migration routes, loss of aquatic species and habitat, displacement of locals, decreasing water quality, etc.) included the destruction of 327 ha of forest land, 128 of which were located in the Cat Tien National Park. Moreover, the large changes in the associated wetland ecosystems would also negatively affect the Bau Sau (Crocodile Lake) located inside the park, which had received international recognition through the Ramsar convention [1;2;3]. The fundamental concerns regarding the environmental impacts led several national groups, i.e., the Vietnam River Network, to pressure the government to stop the projects [1;4]. National experts warned that the dams would violate the law on Biological diversity and that it lacked approval from the National Assembly . Also international pressure increased, when in 2012, the national committee for UNESCO’s Man and Biosphere (MAB) programme urged the government to stop the projects . In a meeting in May, 2013, the World Heritage Committee refused to recognize the site as Natural World Heritage, due to the environmental threats posed by the dam construction, as well as due to other issues, such as presence of quarries and illegal hunting . The growing pressure and complains over the large impacts motivated the Ministry of Natural Resources and the Environment to conduct an assessment study, which confirmed the negative consequences. In response to the Ministry’s report, the increasing national and international concerns, and the strong support and demands from Dong Nai authorities to halt the projects , the Prime Minister finally asked the Ministry of Industry and Trade to remove the dams from the list of planned hydropower stations in late 2013 [1;2;5;]. Thanks to the effective lobbying processes at the local, national and international level from civil society groups, independent experts and governmental actors, environmental justice could thus be served to a unique ecological, social and cultural region. Project Details The dam would have large negative impacts on Cat Tien National Park, which was recognized by UNESCO as a world biosphere reserve on June 28, 2011 . The park covers almost 1,000,000 ha and spans across the provinces of Dong Nai, Lam Dong, Binh Duong, Binh Phuoc and Tay Ninh . Around 450,000 people live in the biosphere Reserve . The Dong Nai dam 6 was initially approved by the Prime Minister under Document No. 1483/CP-CN dated 19 November 2002 and required flooding of 1,954 hectares. The project was later on modified and split into two smaller dams, which reduced the reservoir size to 372.23ha . Dong Nai dam 6 had a planned capacity of 135 MW. Dong Nai 6a had a planned capacity of 106MW . Other sources state that the whole project would have produced 929 million kWh and 14,400 USD of tax revenues per year . The investor who was going to implement the dam was the Duc Long Gia Lai Group Joint Stock Company . It was reported that the company failed to conduct an assessment in compliance with the Laws of Biodiversity and Heritage . The company was said to have invested in the project (feasibility studies, etc.) since 2002 . No information on the total required investment size could be found. Many ethnic minorities live in the area . Most affected by the dam would be the Chau Ma and M’Nong ethnic minority people . Other Potential loss of a man and biosphere reserve park, and related revenue losses from tourism, etc. Why? Explain briefly. The project was stopped before construction started, due to its environmental concerns.